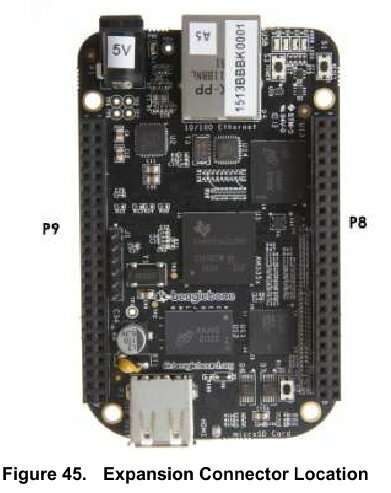 Tuesday hacking evening is tonight to get start with BeagleBone as my RPI is not available for the project I have in mind. So the objective today is to get a LED blinking on BBB board. We have two expansion connector P8 and P9 as displayed on this capture from the main documentation. The Pin number are visible on the PCB. One is alway top left here. Then, we find gpiochip0, gpiochip32 … gpiochip0 correspond to gpio1_xx in the pinout, gpiochip32 to pgio2_xx … So to get the right entry in the filesystem for gpio1_28 (pin 12), you should look for 32*1+28 = 60. To be accessible, the gpio have to be configured by writing its number in /sys/class/gpio/export. this will create a new entry in /sys/class/gpio with the gpio number. This entry is a directory where you can configure & access the gpio. You can then write 0 / 1 in the value file to modify the value. Connect anode to +3.3V, the cathode to 10K resistor, then to Pin12 for GPIO 1_28 (gpio60). 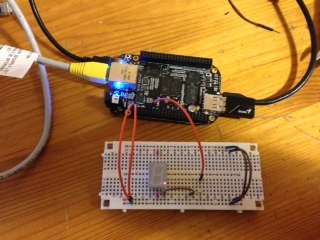 This entry was posted in Hardware and tagged BBB, beaglebone black, gpio. Bookmark the permalink.